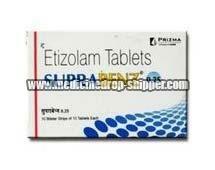 We are a well-established Supplier and Exporter of Suprabenz Tablets in Maharashtra, India. Suprabenz is prescribed for the treatment of anxiety, panic disorders (sudden, unexpected attacks of extreme fear, and worry), and sleep disorders. Suprabenz works by enhancing the action of a signalling a chemical called gamma-aminobutyric acid (GABA), which helps to calm the brain. Suprabenz induces sleep and causes relaxation of muscles in the body.